SIGNificant records the handwritten signature of a person using behavioral biometrical parameters, such as acceleration, speed, and rhythm. This makes the digitized signature forensically identifiable. Supports high-quality signature capture with capacitive pens. We also provide signature verification that authenticates a signature against a pre-enrolled signature profile database in real time. To prevent sniffing of the captured biometric data encrypt the communication between the smartphone and the server. 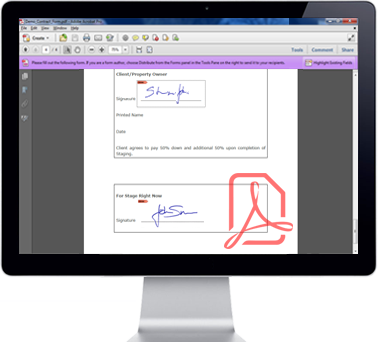 We show the relevant part of the document as the background image on smartphones to provide a visual link between the signature and the document for the signer. To download the SignOnPhone App please click on the store link below. IMPORTANT: This App works only in combination with other SIGNificant products. Please check to see if you use proper SIGNificant Software. If you do not, please do not install this app as it will not work. Contact us today and learn how SIGNificant can help you get documents signed securely using smartphones as signature pads.